McDonald's has big-time issues in China. When the first McDonald's (MCD - Get Report) restaurant in mainland China opened for business on October 8, 1990 in Shenzhen, the store which had about 460 seats, welcomed more than 40,000 customers who were eager to get a taste of the American fast-food. The quick spread of the franchise in mainland cities and its huge popularity among Chinese consumers in the following years helped to fan dreams about a vast potential market of 1.3 billion people who are desperate for a taste of Western food and lifestyle. In 1992 the Los Angeles Times reported on the first McDonald's store in Beijing under the headline "A Cultural Revolution in Beijing, via Golden Arches". In the 1990s and 2000s, eating in McDonald's outlets and hanging out there with friends was regarded as a fashionable lifestyle choice for the mainland's youth. A McDonald's store was often chosen as the site for a first date for Chinese people born in the 1970s and 1980s. Fast forward to 2017, however, and the Big Mac is no longer an exotic thing for most urban Chinese and a McDonald's has long ceased to be the ideal place for a date following a sea change in China's economy, society and lifestyle. "McDonald's means cheap and fast food among teenagers of my kind in Shenzhen," said Dai Lin, a 15-year-old girl and Shenzhen native. "I feel it is nothing special." Rising costs in China are also making life difficult for the fast-food giant. McDonald's in China. Source: South China Morning Post. When McDonald's opened its first shop in Beijing in a downtown area near Tiananmen Square, it received more than 20,000 applications for 850 positions because the average monthly pay of 350 yuan, about US$60 at the time, was very attractive. The minimum monthly salary for a restaurant waitress in Beijing these days is about 3,500 yuan, according to Chinese job websites. Amid rapidly changing consumer tastes, along with the rising rent and labour costs, McDonald's agreed to sell a controlling 52 percent stake in its mainland and Hong Kong operations to China's state-owned CITIC and CITIC Capital. US private equity firm Carlyle Group holds 28 percent, and McDonald's retains a 20 percent stake. The US$2 billion deal was completed last week, turning the big Golden M sign, which is widely viewed as a symbol of American culture, into a "state-owned asset" in China. "Don't boycott McDonald's because it is now a China state business," according to a Chinese social media line. McDonald's has occasionally become a target for Chinese nationalist wrath. In the summer of 2016 after an international tribunal ruling favoured the Philippines in the South China Sea territorial dispute, mobs in a few mainland cities held banners outside McDonald's stores, calling for a boycott of American food. In 1999 after Nato bombed the Chinese embassy in Belgrade during the Kosovo conflict, angry Chinese people smashed up at least one McDonald's restaurant in Beijing. 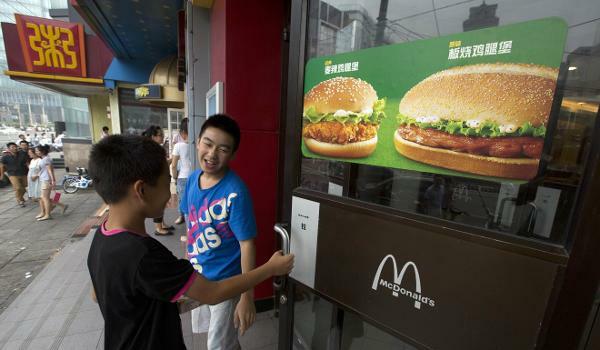 Kids in China enter a McDonald's. Source: South China Morning Post. The new Chinese management announced earlier this week that it plans to increase the number of stores in mainland China from 2,500 to 4,500 by 2022. Of those, 45 percent will be opening in smaller and poorer inland towns, showing a new strategy of penetrating the country's less-developed areas from rich big cities in coastal areas. In China's top-tier cities like Beijing, Shanghai, Guangzhou and Shenzhen where per capita GDP is about US$20,000, the same level as developed countries, consumers are upgrading their spending quickly. McDonald's is increasingly taken as quick, cheap and clean food for China's urban dwellers as the new chic these days is possibly a cup of Starbucks coffee or even a 30 yuan (US$4.50) cup of milk tea , said Yu Jiawen, founder of mobile social networking app Super Curriculum. His app has 33 million users, mostly mainland university students. The attitude change about Big Mac offers "a snapshot to see the country's fast-changing commercial landscape," Yu said.